There have been considerable amounts of examination and reports accomplished on the 1960 small date Lincoln cent, but most of that has been in cataloging repunched mintmarks and die clashes. 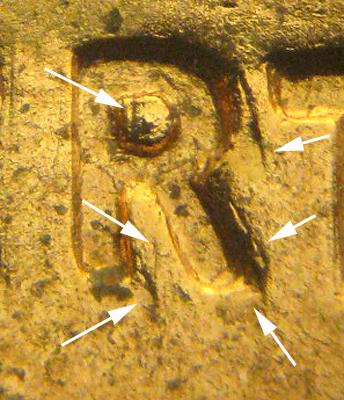 However, I never did see an explanation to the strange marks in and around the letters and the digits of this Lincoln cent. 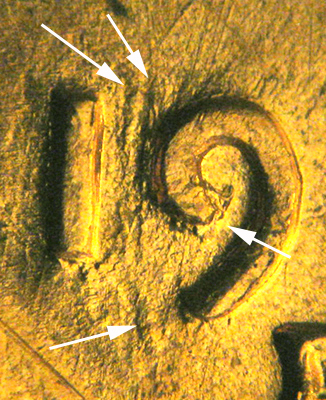 First, we must understand that the entire obverse was engraved except for Lincoln’s bust. Most novices and even some people who are familiar with Lincoln cents look at the obverse of this coin and see doubling. But is it really doubling or something else? Let us look at the first anomaly, the word IN in the motto. The top of the diagonal bar does not seem to be attached to the left vertical bar. The above image shows this disconnect well and it can also be seen where the diagonal bar seems attached. 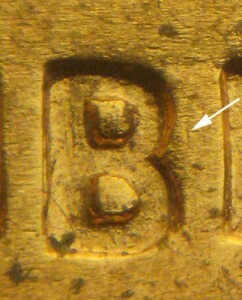 This appears to have happened during the engraving of the die that made the master hub for the year 1960 (SD). The next place we go to is the word LIBERTY. The first letter that we see with some extra stuff is the B. There is a small extra bar seen to the up right of the B (white arrow) and there are faint engravers’ marks seen in the upper loop of that letter. The next letter E has a bit more extra stuff. Three extra vertical bars are seen to the right of that letter. There are indicated with white arrows. 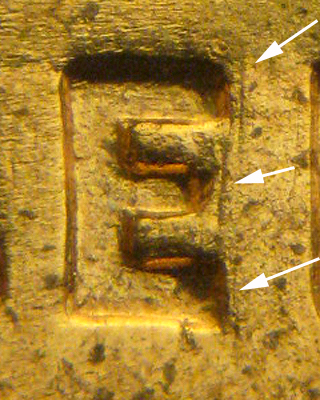 The next letter in line is the R and this letter has the most extra engraving marks. The white arrows point to all the extra engraved marks. The last letter, the Y also has some extra marks as well. There are two extra diagonal bars, one to the left and one to the right, both indicated by white arrows. The date seemed to have its share of extraneous marks as well. The 9 digit seen below has more than a few. There are two vertical bars between the 1 and 9 digits and the upper terminus of the nine digit seems to be squared off and not fully rounded. The six digit appears to have the most extras though. There is a little tail on the top terminus and the inside of the loop is cluttered with engraving marks. 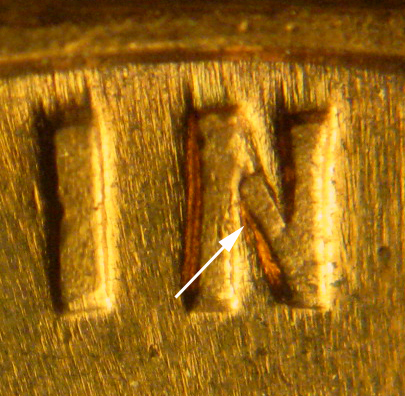 Again remember that all these extra marks will appear to either a great or lesser extent on all 1960 P, D and proof coins that have a small date for they were engraved on the die that made the master hub for this year. 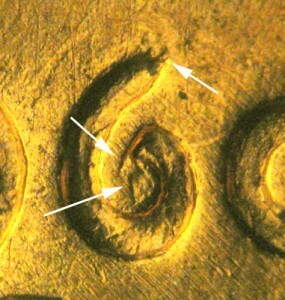 That master hub in turn made the 1960 (SD) master die, then the working hubs and then the working dies. 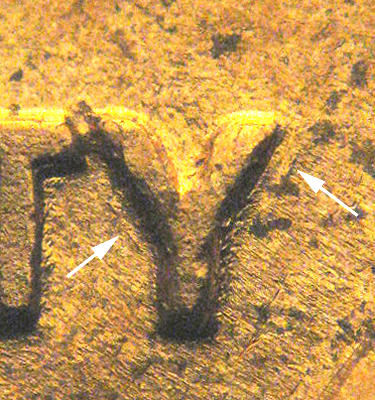 I do hope that this helps you to become a little better acquainted with the obverse of this mysterious Lincoln cent and gain a better insight to collecting doubled dies.